Every generation, of course, has its own version of the "good old days." I was made painfully aware of that the other day when I heard a young woman complaining that no one played the great music of yesteryear anymore (ok, she was 22—maybe she didn't say "yesteryear")—that is, the 1980s. My dear mother-in-law (requiescat in pace) was born in 1905. She lived through two world wars, heard the first radio broadcasts and lived to see TV transmissions sent back from the orbit of Jupiter. For her, the good old days were presumably the early 1930s; she was a young woman, the Great War was long over, and cool minds would surely prevail to prevent those things from ever happening again. 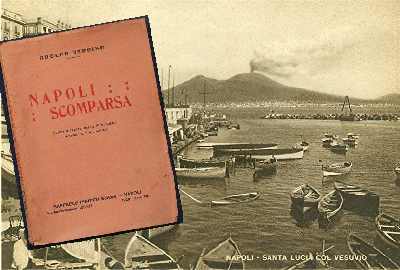 Even earlier: I am reading Napoli Scomparsa (The Naples that has Vanished) by Adolfo Narciso. It was published in 1928. The author was a well-known Neapolitan journalist born in 1877 in the heart of the historic center of Naples. As a lad, he was a postal messenger, a failed actor and once at the age of 14 appeared on the stage of the Caffè dei Mannesi in Naples with another youngster, this one by the name of Enrico Caruso. Narciso gave up the stage and went into journalism and did all right for himself. He died in 1948. He, too, like my mother-in-law lived through two world wars and saw a lot of history and saw his Naples undergo a lot of changes. To him, the good old days were the turn of the century, when he was young and full of energy. The Great War was not even on the horizon; his nation of Italy was new and vibrant. His city was in the midst of a great burst of urban renewal, the Risanamento; and he could sit in the spanking new Galleria Umberto (photo, right), sip coffee and talk about—and maybe in some cases even with— illustrious literati such as D'Annunzio and Croce. Yet, even then, the Naples that he knew as a boy was changing and this is the source of his Napoli Scomparsa. He doesn't regret the changes that produced a new university, wide streets, modern sanitation, but yet…the neighborhoods he wandered as a boy were gone. Many of the changes were in fact dictated by the Risanamento: old buildings torn down, historic churches cut in half to make room for straight roads; old Spanish fountains dismantled; public beaches paved into ports —old haunts simply gone. The heart of the city was a street named via del Porto, described as "…where Corso Umberto now runs, starting at Piazza della Borsa and running to the market at the port". He tells of sitting in the old "Caffè del Commercio" there and listening to a young man play the piano. Another brush with greatness. The young man turned out to be Pietro Mascagni, the composer of Cavalleria Rusticana. "Is this where the historic Caffè dei Mannesi used to be?" "How long ago do you mean?" said she. "About a century. You know—the 'good old days'." "They weren't good for me," she smiled. "I wasn't born yet." The Caffè dei Mannesi must have at least survived the construction of via Duomo in 1880 for Narciso to speak of it as being on the corner; yet, many buildings in that area—known as Pendino—were simply cleared away. This was Narciso's neighborhood, and he has a touching story. He was a young boy when the devastating cholera epidemics hit the city in the 1880s. He remembers people simply dying in the streets. Other sources put the toll at a staggering 7,000 per week (!) for a while. He speaks very kindly of the politicians who put their lives at risk to mingle with the people—including not only the prime minister of Italy, but the king, himself(! 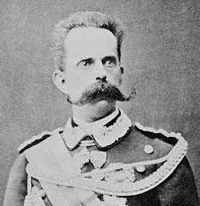 )—Umberto I (photo, left), still referred to in Italy today as il Re buono, the Good King. Narciso's mother lay dying from cholera and the author recalls how he ran up to the king on the street to plead for medicine. The monarch stopped, had an aide jot down the address, and within hours someone showed up at the home with medicine. It was, as it turned out, too late, but Narciso never forgot the episode: the king had not forgotten them. When one speaks of urban renewal in Naples, the focus is naturally on the Risanamento. That period ended officially in 1915 upon Italy's entry into WWI. Yet, there was another period of urban renewal in the city after Napoli Scomparsa was published (and well before the forced rebuilding in the wake of WWII). That was the Fascist renewal of the 1920s and 30. Large sections of the city show the effect of that: the passenger terminal at the port, the new post office, and other huge bits of totalitarian architecture meant to be imposing. At the time that Narciso published his book, he could still wander down to a quaint area by the port, a small secondary port called the porticciuolo. He could have a coffee and reminisce about being on the same stage as Caruso once upon a time. The little port had historic importance and was the site of the old Portosalvo church at water's edge and the old custom's station. The Risanamento had left it intact, bridging it with a new port road but leaving space beneath the bridge for water exchange. Mussolini's megabuilders, however, in their drive to expand the docks, filled in this quaint but useless speck of water in the 1930s and cut off that section of town from the water forever. I passed by a building now known as the Zanzur Barracks (so-called for the locale in Libya from which an Italian military unit took its name after the Italian invasion of Libya in the early 1900s). Although the building has not moved, it is now about two blocks from the port, whereas it used to be at water's edge. I almost walked by the historical marker, but I stopped and read. I was at the entrance to a much made-over building and "…all that is left of the largest of three naval dockyards from the time of the Anjou reign, built from 1305 on…"
The 14th century. Now those were the good old days.